Home » Unlabelled » Texans Football is BAAAAACK! 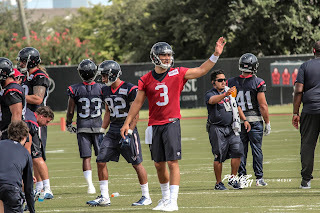 Today was the first official day of Training Camp for the Houston Texans presented by Xfinity. The squad looked a lil rusty, but thats expected from the time off from the previous season. Coach OBrien and the coaching staff had there hands full scoping out players and getting things in order. Mercilus and Cushing looked good for the first day of camp, along with the anticipated performance of Brock Osweiler. The 6ft 6in quarterback ran a few drills that looked promising for the season. 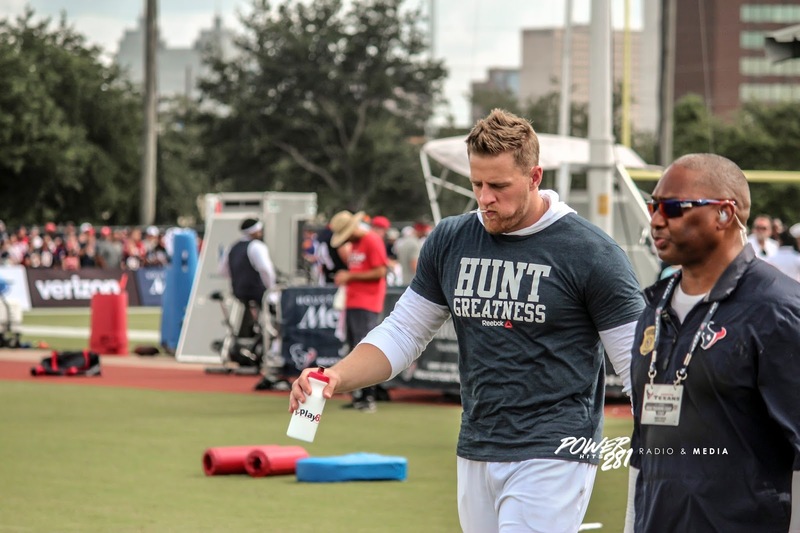 Even though he wasnt suited, the fan favorite, JJ Watt walked out on the field and the fans went craaaaaaazzzyyyyy. If you didnt notice he was being escorted and body guarded by a young man also by the name of Justin, who was also a crowd favorite. Justin is waiting on a heart transplant through the Make A Wish Foundation. He and JJ waved to the fans, played catch and captured the hearts of the spectators. JJ had back surgery a few days ago, and to still see him interact and show for the 1st day of practice was surreal for a few. And of course was the topic of discussion between the team fans and Coach O'Brien. When ask about if he was going play the first game of the season, JJ responded.... "I cant put a start date on when I will be able to play, but I have never missed a game in 5 years". So as a supporter and fan, we hope JJ has a speedy recovery and hits the field soon. Also, during the press conference, Obrien addressed D.Hop sitting out practice by saying, "I'm very focused on the guys that are out here today, I love coaching the guy and I speak for everybody here when I say he's an exceptional player, and when he comes back he will be thrown right in there". In case you didnt know D. Hop was holding out for more bread and butter, and in an update headline, he has decided to return to practice so maybe an agreement was met. We will find out at a later date. All in all it was great start to Training Camp. We hope the season starts off just as great.So now the question is, how confident are the Texans in selecting the 2017 Team. Who will make the cut? Well if you are a fan, you have about 5 more practices that are open to the public to see who will make the final roster. Visit, www.HoustonTexans.com for more practice dates and how to obtain your tix.